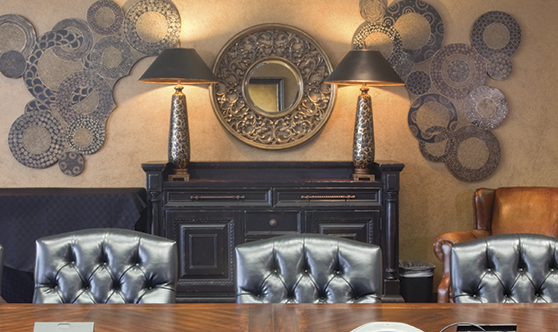 Established in 1989, Faux Effects International, Inc. is a privately owned and operated corporation dedicated solely to the development and manufacture of environmentally friendly, high quality, faux and decorative finishing products. Unlike the competition, our business structure is based on a unique triad of invention, production and artisan training. This distinctive combination of distributorship and training facility, in addition to online Internet ordering and technical assistance, allows creative individuals easy access to materials and education. For those individuals that have chosen the art of decorative finishing and/or paint contracting as a career, our proprietary products and application methods will afford a distinct competitive advantage in an increasingly popular and challenging discipline. A large part of establishing an excellent reputation in this field involves using fine quality materials and teaching the artistic skills necessary to use them. Providing these essential elements is the driving force behind FEI. FEI Gold and Silver products are the end result of over 50 years of professional experience in the industry. One of the first companies to offer water-based finishing mediums, FEI offers an alternative to hazardous, toxic materials in the marketplace. These unique patented product lines and their methods of application are recognized worldwide by professional and amateur artists alike as the pre-eminent faux and decorative finishing means of expression for the creation of beautiful works of art.